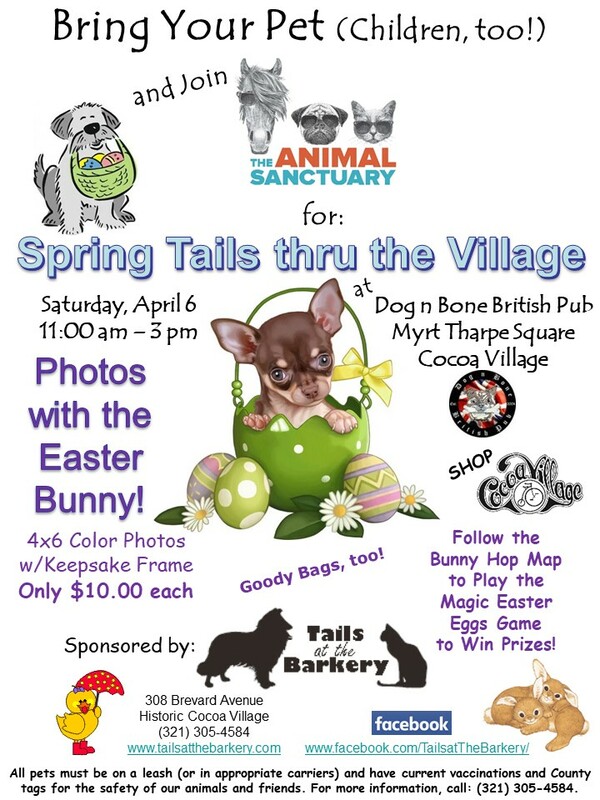 Bring your pet and children, too, and join The Animal Sanctuary (TAS), a nonprofit, volunteer organization, for Spring Tails thru the Village, in Cocoa Village. Sponsored by Tails at the Barkery, this event will help raise much needed funds for the animals TAS rescues and the building of Brevard County’s first no-kill, no cage, animal sanctuary. The majority of animals who come to TAS have medical conditions resulting from neglect or abuse, some have behavioral and emotional issues, some arrive as strays, suffering from illness and injury, and all are in need of love and attention, which TAS is happy to provide. Follow the Bunny Hop Map to play the Magic Easter Eggs Game to win prizes! For a $10.00 donation, receive a goody bag and a framed 4×6 color photo with the Easter Bunny. All pets must be on a leash, or in appropriate carriers, and have current vaccinations and County tags for the safety of our animals and friends. Free; All donations are Tax Deductible and greatly appreciated.